Dr. Jonathan Townsend (lower-left corner), stands outside the veterinary surgery unit at the Indiana State Fair talking to the general public after an educational lecture on the role of dairy cows in Indiana. 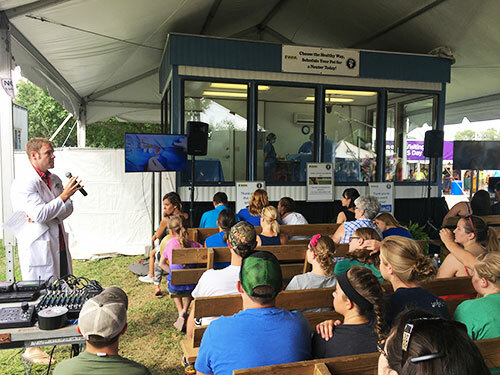 In addition to participating in educational talks like these, Dr. Townsend helps coordinate veterinary medical services for all the exhibition animals at the fair. 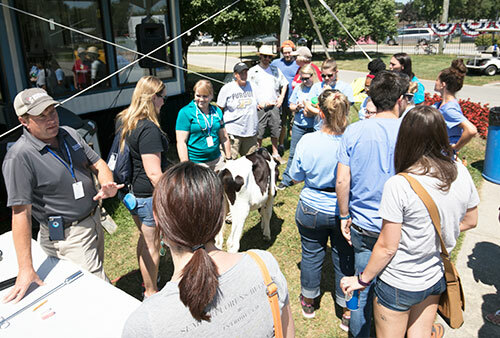 Purdue Veterinary Medicine is in the spotlight at the 2017 Indiana State Fair in Indianapolis, where a large tent on the north side of the fairgrounds houses surgery demonstrations, educational presentations and the Indiana State Fair Vet Camp. The State Fair opened August 4 and continues through this weekend, ending on Sunday, August 20. "The Indiana State Fair is a great location where we can showcase the important role that veterinary medical professionals play in the lives of Indiana citizens every day," said Dr. Jim Weisman, clinical associate professor and director of PVM Student Services, who is the first veterinarian to serve as a member of the State Fair Board, and serves as the fair's vice president. "We are honored to partner with the Indiana Veterinary Medical Association to put on the live surgery demonstrations, and are excited to provide wonderful hands-on learning experiences for young people through our Indiana State Fair Vet Camps." 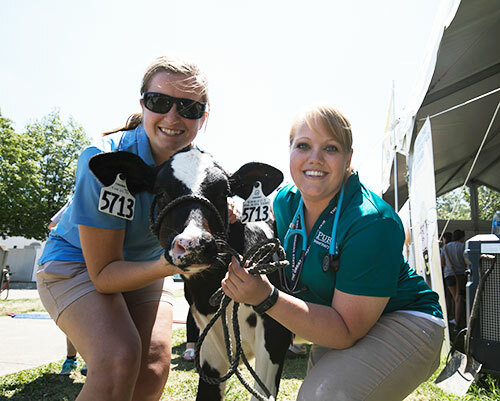 Additionally, for the fourth consecutive year, PVM faculty and veterinary students are providing veterinary care for all the fair's exhibition animals, covering everything from respiratory conditions to animal testing. Dr. Jonathan Townsend, Purdue Veterinary Medicine clinical assistant professor of dairy production medicine and director of Extension, assists in coordinating all the veterinary services for the exhibition animals on the fairgrounds, including most of the 4-H animals. "With this many thousands of animals on the grounds, there are always a few animals who are a little sick. We do more and more every year to help screen the animals at check-in," he said. Drs. Weisman and Townsend are among the many PVM faculty, staff and students who make the College's extensive involvement in the State Fair possible. A key group of PVM staff including Becky Bierman, Jeannine Henry, Julie Roahrig, and Megan Elliott provide daily support for the PVM/IVMA surgery exhibit. In addition to these, dozens of people are involved in the coordinated efforts to fulfill PVM commitments over the course of three weeks with long hours amid thousands of animals. "This is an amazing opportunity for us to do outreach in the community and to talk about the importance of animal health for pets, production, and harvest," said Dr. Townsend. "Also it's fun to be here and it's a great opportunity for our students." Dr. Eric Hans (PU DVM 2011) narrates as Purdue Veterinary Medicine faculty and staff perform a live neuter surgery in the sterile surgery demonstration suite co-sponsored by the College and the Indiana Veterinary Medical Association at the Indiana State Fair. PVM students Rachel Wright (left), of the DVM Class of 2019, and Katelyn Steinkamp, of the DVM Class of 2018, pose with Petunia, a three month old dairy calf. Petunia is one of many animals at the Indiana State Fair that receive veterinary health services from PVM students and faculty who volunteer their time and expertise at the fair. A young fairgoer at the Indiana State Fair pets a baby goat. 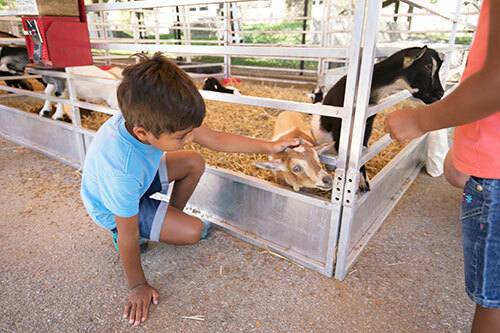 Purdue veterinary students and faculty meet the veterinary needs of all the exhibition animals at the Indiana State Fair, including all the goats at the petting zoos. 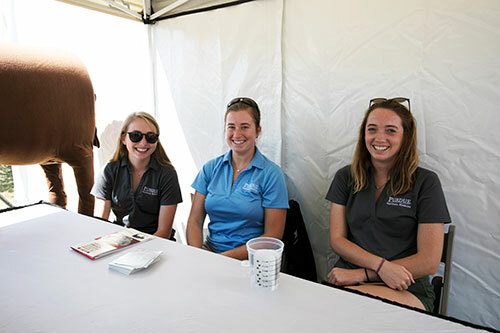 PVM students (left-right), Julie Deslauriers, of the DVM Class of 2020, and Rachel Wright and Alexandra Osborne of the DVM Class of 2019, enjoy the shade outside of the mobile surgical center, where they talk to Hoosiers about Purdue Veterinary Medicine.